While Apple's OS has made great strides in terms of market share since we first glimpsed it back in Jaunuary 2007, the last year has really seen Android lay down the gauntlet - and it continues to improve. Android 2.2 brought a whole host of performance updates over 2.1. From an improved battery to considerably less choppy video recording, things are just generally better with 2.2. As it was if you had an iPhone 3G and upgraded to an iPhone 4. However, iOS 4 didn't play nicely with older iPhones - though an update finally seems to have rectified this annoying problem. Windows Phone 7 phones have internal storage and no microSD like the iPhone, but Android handsets are more flexible and many offer expandable storage. 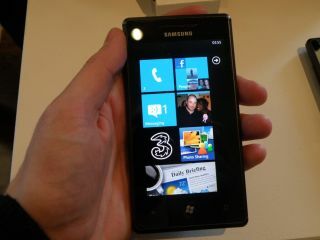 The requirement to have a touchscreen is part of the Windows Phone 7 'Chassis 2' specs which Microsoft has laid down for all Windows Phone 7 handsets. All also have a 1GHz processor, a 1500mAh battery and Bluetooth 2.1, along with a 3.5mm headphone jack. All three platforms now support 720p video recording, while Android 2.2 also supports Flash - unlike iOS, of course. Windows Phone 7 may have the technology, but it's not available at launch. While iOS 4.1 features HDR images, the big boon of the camera in Windows Phone 7 is that it starts so quickly. There's also an option to auto-upload to Windows Live SkyDrive, though this will eat your data in no time at all. A Wi-Fi hotspot support is included in Android 2.2 but this is a miss from the other operating systems, even if Windows Phone 7 and iOS 4 both support tethering. While we don't believe Microsoft will make as much headway with Marketplace as Apple has with the App Store, there will still be plenty of opportunity and flexibility for developers, a demographic Microsoft is keen to get on with. While Windows Phone 7 certainly isn't open like Android, Microsoft will welcome app developers - especially those who are prepared to adopt the Windows Phone 7 look and feel. The iPhone's new folders functionality is an admission by Apple that things are getting out of hand, but we're surprised not to see Android's five "up and down" home screens as well, rather than the endless scrolling to the right. And although the folders auto-rename, we're disappointed there are no auto-grouping options based on App Store categories. At a time when Apple's iPhone UI still holds major influence over the market (look at Samsung's latest phones to see why), Microsoft has managed to at least mix things up a little with Windows Phone 7. Taking the best aspects of the Zune interface and combining them with the dynamic tiled approach is clever – we're fans. The Windows Phone 7 interface remains the same as when we first saw it back in February - a long list of tiles displaying information from various areas of your handset including new emails, texts and upcoming events. You can pin any important app to this Start screen or drag to move it, as you can with the customisation in Android 2.2 and the app icons in iOS 4. All are really quick and responsive. Microsoft has really worked at Windows Phone 7 and apps load extremely quickly. There's also a fuller 'Start menu' off to the left, much like a different version of the main app launcher in Android 2.2 - you don't often use it, but it's good to have there. Like on Android 2.2, you get a notification at the top of the screen in Windows Phone 7 when you get a text as well as an addition to the messaging app. It's certainly nicer than the mid-screen pop-ups you get all the time on iOS 4. The keyboard is great on Windows Phone 7 - in both portrait and landscape modes it's highly accurate and decent at word correction too - very similar to iPhone/HTC levels of accuracy. The iPhone's keyboard is well-known but the over-officious correction can be irritating, while the keyboard in Android 2.2 is excellent though we find our typing can be inaccurate from time to time. The multitasking in iOS 4.0 features a four-app overlay that's light years beyond the nasty multitasking on, say, S60 handsets, but still behind Android 2.2's clever app-switching. Windows Phone 7 remains a relative wasteland for multitasking, though it may appear in a future version. The Game Center was one of the more surprising announcements during the iOS 4.0 keynote, after all gaming is working well on the handset and is certainly reeling in the cash for developers. However, it will bring a new social, cloud-based side of gaming to the iPhone, while there's even a way to find gaming buddies online as well as leader boards and possibly gaming points. Apple clearly sees this will roll out in a big way to the iPad, too. Microsoft also talked up gaming with the Games Hub in Windows Phone 7. There's Xbox Live integration, while Windows Phone Marketplace will feature plenty of games from the likes of EA. "We're going to have a launch portfolio of games that's bigger than the one we had with the Xbox 360. "We're fully thinking of [this platform] as a games console. Games like Fruit Ninja will be important, harnessing a number of features like access to friends and connecting to other Xbox Live users." Android certainly appears to be lagging behind in terms of gaming - it's certainly an area where Google's OS lags badly.